Honda India is one of the most reputed car makers and the company has a splendid fleet of cars. Among all the vehicles available in their fleet, Honda Brio is the popular hatchback. It is available in several variants, out of which, Honda Brio VX AT is the top end trim. It is equipped with a 1.2-litre petrol engine, which can churn out 86.8bhp along with 109Nm of maximum torque. With a five speed automatic transmission gear box, it can achieve a maximum speed of 185 Kmph. While it can cross the speed barrier of 100 Kmph in close to 16 seconds. The company is offering this hatchback in quite a few vibrant exterior paint options. These include Energetic Blue, Urban Titanium, Alabaster Silver, Crystal Black with Pearl Finish, Rallye Red and Tafeta White. The exteriors of this compact hatchback are designed with some remarkable features that include stylish alloy wheels, chrome treated front grille, headlight cluster and so on. On the other hand, its internal cabin is incorporated with air conditioner, power steering mounted with control buttons and many more such striking features. The company is offering this hatchback with a 2-years/40,000 Kilometres warranty, whichever is earlier. 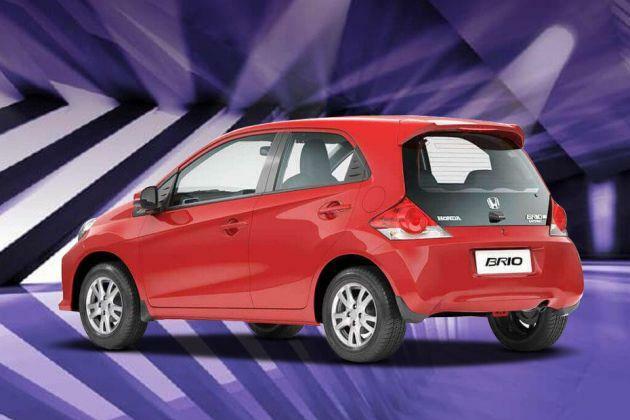 The exteriors of this compact hatchback are refreshing with a number of striking features. To begin with the frontage, it has an aerodynamic body structure and a few visible character lines on the bonnet as well. The radiator grille comes with a lot of chrome treatment and a proficient badge of the company embossed in the center. The dual tone bumper has a wide air dam and is flanked by a pair of bright fog lamps. The neatly carved headlight cluster has been equipped with high intensity halogen lamps and turn indicators. It has a large windscreen that is integrated with a set of intermittent wipers. The side profile has body colored external rear view mirrors and door handles, while it also has bold character lines that adds to the elegance. The neatly carved out wheel arches have been fitted with a modish set of 14 inch alloy wheels. These rims are further covered with radial tubeless tyres of size 175/65 R14. The rear end is elegantly designed with radiant tail light cluster, an expressive chrome plated boot lid and bumper with fog lamps. Apart from these, it also has an antenna, which is mounted on the roof, rear windscreen with a defogger and mud flaps. The overall dimensions are quite standard and the car can accommodate minimum five passengers with ease. It comes with 3610mm of total length along with a width of 1680mm and a decent height of 1500mm. It has a roomy wheel base of 2345mm and a minimum ground clearance of 165mm. The internal cabin of this Honda Brio VX AT variant is done up in elegant dual tone beige (dark and light beige) color scheme. The leather wrapped steering wheel, hand brake lever and gear shift knob comes with silver accent, which gives the cabin a modish look. The instrument cluster comes with sporty amber color illumination and fitted with quite a few features. The car manufacturer has bestowed this hatchback with a number of storage spaces, which further adds to the convenience of the passengers. These are front and rear cup holders in the central console, map pockets in all doors, seat back pockets for keeping smaller things at hand, a spacious glove box and so on. Apart from these, it has sun visors with vanity mirror, silver accentuated inside door handles, front door lining cover, foldable rear seat back, chrome plated AC vents and so on. This variant is fitted with a single overhead cam shaft based 1.2-litre petrol engine, which has been equipped with a i-VTEC (intelligent Variable Valve Timing) technology. This power plant has the capacity to displace 1198cc , which is integrated with 4-cylinders and 16-valves. It is skilfully mated with a five speed automatic transmission gear box, which sends the engine power to its front wheels. This petrol mill has the ability to generate a peak power output of 86.24bhp at 6000rpm in combination with a maximum torque of 109Nm at 4500rpm. It is incorporated with PGM-Fi (programmed fuel injection) supply system, which enhances the fuel efficiency. The company claims that this hatchback can produce a decent mileage of 16.5 Kmpl on the highways and 13.3 Kmpl in the city limits. The front wheels of this automatic hatchback is assembled with a set of solid disc brakes, while the rear wheels have been fitted with drum brakes. This mechanism is further augmented by anti lock braking system along with electronic brake force distribution. On the other hand, the front axle is fitted with a McPherson strut, whereas the rear axle is equipped with a torsion beam type of mechanism. The electronic power steering system is quite responsive and makes handling smooth even in heavy traffic conditions . This tilt adjustable steering wheel supports a minimum turning circle radius of 4.7 meters, which is quite decent for this segment. The list of comfort features integrated in this hatchback are an electronic power steering with tilt adjustment function, air conditioner unit with a heater, central locking system with keyless entry, all four power windows with driver side auto down function. The advanced music system is equipped with CD/MP3 player, AM/FM tuner, USB interface, Aux-in port along with four speakers . Apart from these, it also has electrically adjustable external rear view mirrors, a fuel consumption display in the instrument cluster, a tachometer, an accessory socket and so on. This Honda Brio VX AT is the top end variant in its model lineup and the company has blessed it with a lot of crucial safety features. The list includes an engine immobilizer, i-SRS airbag for driver and SRS airbag for co-passenger and front seat belts with pretensioner and load limiter for added safety. Apart from these, it also has a driver seat belt warning notification in the instrument cluster, a day/night internal rear view mirror, a centrally located high mounted stop lamp, dual horn, headlight off and ignition key off reminder notification. It also has an ABS along with EBD for efficient braking mechanism. 2. Spacious interiors with decent comfort and safety features. 1. Mileage should be made better. 2. Boot space is quite less.